The total market size for organic packaged food and beverages in the Netherlands in 2017 is US$835.4mn, making it the 9th largest market in the world by value. Per capita spending on organic packaged food and beverages in the Netherlands is US$48.88, which ranks as the 7th largest spending per capita in the world. The largest company by sales in organic packaged food and beverages is Royal FrieslandCampina, which maintains 6.3% of total sales. It is followed by oninklijke Wessanen NV and Stichting Merkartikel Bio+. Organic packaged food and beverages in the Netherlands will see moderate year-on-year growth of 5%-6% in 2018, which is on par with the rest of the Western Europe region. The Netherlands maintains a market size for organic packaged food and beverages of US$835.4mn in 2017, which is 2.1% of global category sales. Within the Western Europe region, Germany, France, the UK, Italy, and Sweden all surpass the Netherlands in total value sales of organic packaged food and beverages. 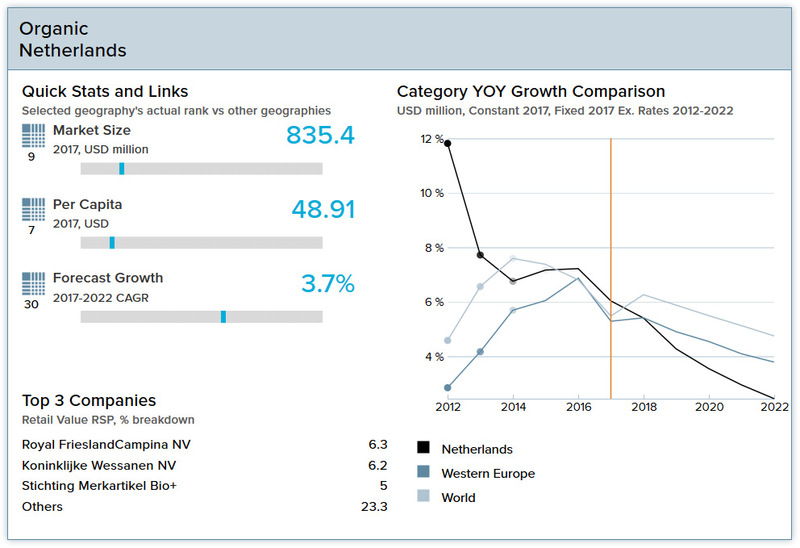 Despite the large market size, the Netherlands will experience slow forecast growth of sales of organic packaged food and beverages, at a 3.7% CAGR from 2017–2022. Dutch consumers’ increasing health consciousness and demand for products with environmentally responsible production methods will fuel growth; new products, notably private-label products, will emerge to satisfy demand. Organic dairy leads in terms of sales value among organic food categories, and organic non-cola carbonates top the list among organic beverage categories. Organic food and beverages tend to be more expensive than their conventional counterparts in the Netherlands, but the expansion of private-label organic products is providing lower-cost organic options. Sales of organic packaged food and beverages have registered healthy growth in recent years, driven by Dutch consumers’ demand for more natural products with traceable and transparent supply chains. The organic packaged food and beverage landscape in the Netherlands is fragmented and competitive. Netherlands-based Royal FrieslandCampina NV is the market leader with 6.3% value share in 2017, followed closely by fellow Dutch company Koninklijke Wessanen NV with 6.2%. Private label products accounted for 43.7% of sales value in 2017. Sales of organic packaged food and beverages are projected to see growth in coming years, albeit at slower rates than in previous years. This growth will be fuelled by Dutch consumers’ increasing health consciousness and demand for products with environmentally responsible production methods. New products, particularly ready meals, will emerge to satisfy this demand. Organic edible oil is projected to record higher sales growth than other organic foods in the near term. Organic non-cola carbonates are projected to have the highest sales growth rate among organic beverages. Dutch consumers are looking for pure and healthy products. The most popular health and wellness products are perceived as natural, artisanal and honest. Specific health claims for products are uncommon in the Netherlands, as many consumers infer that ingredients have been added to be able to make those health claims and, consequently, see the product as less pure and natural. In the last several years, Dutch consumers’ attitudes toward sugar has shifted dramatically, leading many to view even natural fruit juice in the same light as sweetened carbonate soft drinks. Real GDP will grow by 2.5% in 2018—down from 3.2% in 2017. Inflation was 1.4% in 2017 and is projected to be 1.5% in 2018. The unemployment rate was 4.9% in 2017, and that figure is expected to fall in the near term. In 2017 the population of the Netherlands was 17.1 million, up from 15.9 million in 2000. The median age in 2017 was 42.6 years—5.3 year older than in 2000 and above the regional average. Unless immigration increases, the Dutch population will continue to age, which could put strains on government finances and the economy. The aging Dutch society could eventually have a profound effect on many consumer markets since most of the elderly have accumulated considerable wealth and enjoy generous pensions. 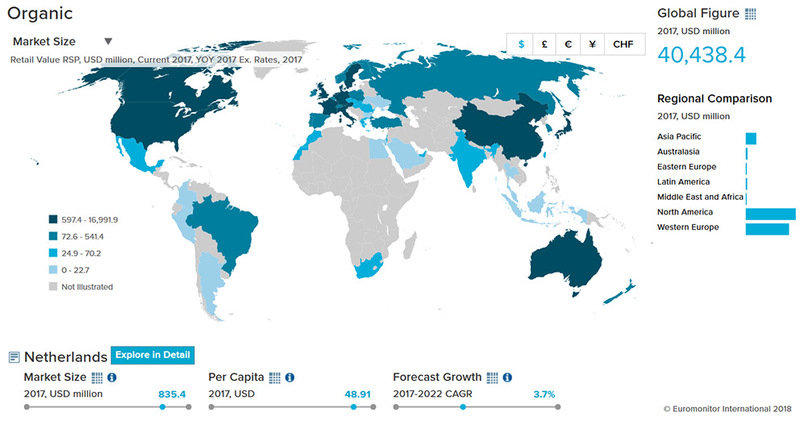 Per capita consumer expenditure was US$20,752 in 2017 and is projected to increase by 1.6%in 2018.